Are Red-Eared Sliders & Painter Turtles Compatible? If you have a pet turtle, then it's your job to make sure he's as comfortable in his environment as possible, whether it pertains to diet, enclosure, lighting needs or living partner. Red-eared sliders (Trachemys scripta elegans) and painted turtles (Chrysemys picta) are both commonly kept pet turtles -- with similar requirements and lifestyles. Red-eared sliders and painted turtles are physically very similar. Not only are they often alike in the basic size department, their upper shells are also alike, color-wise. Despite that, they have their physical differences, too. Red-eared sliders, for one, have telltale crimson coloration right in the back of their eyes. Their upper shells are usually a little steeper in comparison to those of some painted turtles. If you're on the lookout for those key differences, you should be able to guess which turtle is which. Red-eared sliders and painted turtles, in terms of lifestyle, have a lot in common and are often compatible as tank mates, living together peacefully and contentedly. They also have the potential to do well with other turtles that have much in common with them, with Florida red-bellied cooters (Pseudemys nelsoni) as just one example. Basking turtles on the whole can have success in living together, but always consult a reptile veterinarian before making arrangements for your pets. Don't assume that a red-eared slider or painted turtle can get along with just any pet turtle. Even if they're peaceful around each other, clashing lifestyle requirements are often a major issue among different varieties of turtles. Remember too that turtles from varying locales can often transmit parasites to each other, leading to sickness and other problems. Some turtles are more vulnerable to certain parasites than others. These potential sicknesses can sometimes even have deadly consequences, so take the matter seriously. Red-eared sliders and painted turtles are often close in size, although not in all cases. 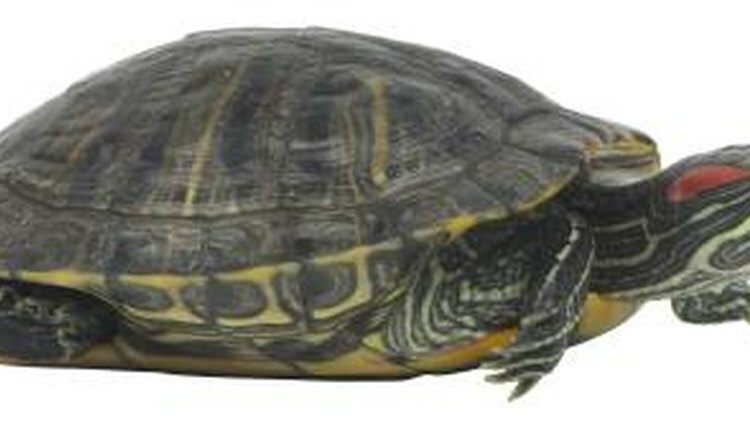 Some mature female red-eared sliders can exceed 13 inches in length, while some mature female painted turtles are as small as roughly 6 inches. Avoid keeping turtles with major size differences in the same enclosures, as aggression could be a possibility. If you ever notice any fierce behavior such as nipping amongst your pet turtles, regardless of species, get them away from each other immediately. Red-eared sliders and painted turtles both require spacious habitats that feature basking sections. When it comes to selecting housing for these turtles, larger is preferable. Pairs generally work well in tanks that can accommodate a minimum of 75 gallons or so. Both species are omnivorous. Mature specimens of both species tend to have more herbivorous tendencies, however. Commercial turtle pellets generally make strong foundations for both red-eared sliders and painted turtles. If you're ever uncertain about how to feed your pets, consult a herpetological veterinarian for diet planning. Turtle - Your Happy Healthy Pet; Lenny Flank, Jr.
What Species of Turtles Do Well Together? Can You Put Different Types of Turtles in the Same Tank Together? Can You Keep a Red-Eared Slider and a Yellow-Bellied Turtle Together? What Can a Yellow Belly Turtle Eat? How Big Will a Yellow-Bellied Turtle Get? Can Multiple Plecostomus Be Put in the Same Tank? Can Two Bearded Dragons Be Kept Together?